In Paris, a gastronome's heaven, quality ingredients are the cornerstone of good food. This recipe celebrates just that: the simplicity and excellence of the raw ingredient. In my opinion, this salad is just one example of the most complementary combination of food groups: fruits, nuts and cheese. This salad is perfect as an elegant starter or a side to complement any meat or fish entrée. Wash and "peel" endive. Remove each individual endive leaf, wash, pat dry, and place on large plate or bowl (for presentation, lay endive curled-side up, arrange endives around center in a circle). Wash, cut pear in half, and thinly slice pear wedges. Lay pear slices on top of endives (again, for presentation arrange in circular pattern on top of endives). Crush walnuts. Place walnuts in skillet, flash roast on medium-high heat. Add a teaspoon of sugar in skillet while tossing/stirring walnuts for no longer than five minutes, depending on the intensity of your stove. Keep a close eye on the walnuts as to not burn then. Call them done when edges darken (not blacken!). 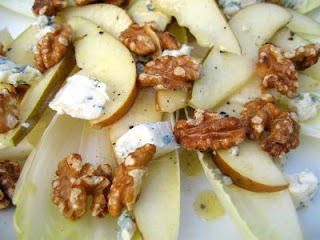 Sprinkle walnuts on top of pears. Finish salad with crumbled Roquefort on top. so i just looked up endives in wikipedia and apparently they're related to daisies.